Rare, Premium Penthouse -- Spectacular Views !!! This condo is for you if you value space (1800 square feet), comfort and breathtaking views, all at a fair price. Guests regularly tell us it's the best condo they've ever rented. Perfect for families. Read on. This is our Rocky Mountain home--our retreat from the busyness of everyday life. We invite you to share this very special place with us. Tastefully appointed with comfortable leather furniture, this GOLD RATED condo rests on the top floor of the Saints John building overlooking Keystone Resort. With 2 large bedrooms, a huge living room and a separate Library, there's plenty of room for everyone to spread out. Enjoy your kids and guests without being on top of them. Eat next to a WALL OF GLASS overlooking the ski mountain (great at night!). Watch the snow fall from our balcony. Enjoy the Master BR with private bath, KING bed, gas fireplace and walk-in closet. Gasp at the BREATHTAKING VIEWS! Watch DVDs and play games--this condo has practically every amenity, including WiFi internet. It's modern and up-to-date. Plenty of closets. Check out the PHOTO LINK below (the rooms are much larger than they look here). Read in the PRIVATE LIBRARY offering a wall of windows, Murphy Bed (double, and comfortable! ), desk, sofa and plenty of books. The second KING BEDROOM is large with an additional TWIN bed, closets galore and a wall of windows facing the Arapahoe National Forest. The kitchen is stocked for the culinary-minded. This condo received Keystone's GOLD RATING for quality of furnishings, updated decor and overall condition. Nested against a bluff, the building is extremely QUIET and CONVENIENT, with covered parking and ski lockers below. Keystone's efficient shuttle (every 20 minutes) whisks you to the slopes in no time (3 stops away) and back in the afternoons in only a couple of minutes. That's far better than paying to park and carrying your skis. Plus, skiers in your group can come back at different times. It's fast and convenient. EMAIL US with any questions! We love Keystone and are happy to help make your vacation memorable. We prefer renting to discriminating families and couples who will care for our condo like it was their own. Click below for previous GUEST COMMENTS and MORE PHOTOS. PLEASE CONSULT OUR ONLINE AVAILABILITY CALENDAR BELOW! We live in Nashville, Tennessee and have been visiting Keystone for over 25 years. We feel very blessed to have this special place in the mountains, and enjoy sharing it with others, especially families and couples like ourselves. Feel free to email us with questions. Julie's parents, Tad and Judy, own the condo next door and spend several months a year there. Enjoy truly exceptional views from this top floor, end unit. Also, rent with confidence as you will receive a rental confirmation directly from Keystone Resort, with 24-hour Check-in/Check-out services, from the resort, and resort charge privileges during your stay. Nestled into Keystone Resort, complete with Spa and plenty of activities and varied restaurants. Keystone is known for its relaxed, family-friendly environment. See photos. The views are AMAZING year-round, night and day, rain or shine. This is a top floor, end unit with views from 3 sides. Local landline in unit. Please bring cell phones for long distance. Nice, clean building laundry room. Takes credit/debit cards for convenience. Packing Tip: a ziploc of your favorite laundry detergent. We cook a lot and the kitchen is stocked with serving dishes, appliances and the usual appliances you might have at home (blender, griddle, slow-cooker, etc). Family dining table by a wall of glass windows overlooking the mountains. Board games in the condo. Beautiful views from the covered deck off the dining area and the master bedrom. Nice seating area. Once flight of steps at entry; otherwise, unit is all on one floor. 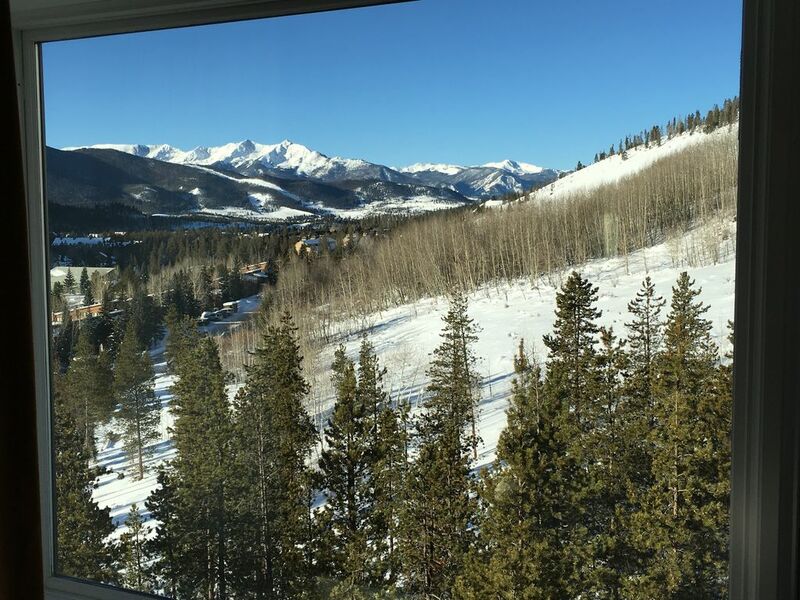 Very nice condo with beautiful views of the mountains. Right on the Keystone Red Shuttle route for quick, convenient access to Keystone’s River Run slopes. Also near the free Summit County shuttle bus route for access to the other resorts in the area. Even if you want to drive, it’s under 20 min. to Dillon, Frisco, Breck and the various shops and restaurants there. Free Ski lockers and hot tub on condo premises. Owner and condo manager very responsive if questions arose. Thank you for being such great guests! This place was awesome, I would not do Keystone any other way. I received a nice attaboy from the wife the moment we walked in. The views were great! We saw a pair of coyotes, cow and bull elk, and several moose out the back windows that overlook a mountainside. It was about a 5 minute drive to the ski lifts. With the layout of Keystone, we found this to be perfect. There are two base areas and this was across the street and about halfway in between both places. We have three kids so if it’s not a true ski in/out spot (most are still a hike despite what they say), I would rather do it this way. There’s a shuttle or a parking lot that both land you right there. Super convenient from that perspective and you don’t get the views, scenery, nor wildlife from the ski in/out spots! When we go back to Keystone I think my whole family would want to stay in this exact place again. It is a very nice, beautifully appointed condo inside with a very comfortable elegant feel. Thank you very much for letting us stay there!! This is our second year in a row going out to Keystone and what an upgrade to stay in Lee's beautiful condo. We loved everything from the indoor parking, the spacious layout of the condo, the comfortable beds (including the library murphy), the kitchen, the views (we loved watching the elk on the hill in the back), and the bus to skiing (our skis were in storage at Mt House which we prefer to River Run so it took us a day to figure out the best way to get there because the bus that picks you up in front of the condo only goes to River Run and then you have to switch buses but if you drive 1/4 mile down St Johns road from the condo and park in the free parking lot and take the purple or blue bus, you go straight to Mt House which we did every day after we figured this out). This was easy and avoided the $20/day parking fee. The condo was spotless clean and perfect. Beautiful views, plenty of room in the unit, a wonderful place to stay. Will be back again. Top notch condo and well equipped. Very large with plenty of room for six people. Beautiful condo and beautifully decorated with beautiful views. Excellent location with on time bus transportation to any place in Keystone. Condo well supplied with all your needs. Don’t forget your binoculars to capture the views! Hi Mark! So glad that you enjoyed our spot in the Rockies! Thanks for the kind words. Please feel free to reach out to me with any questions at all! This unit is a premier, top-floor, end-unit with incredible views and updated furnishings. We value renting to guests who will care for it as if it was their own second home. Please also remember that our building only permits pets for owners, and strictly enforces this rule.